A stunningly beautiful inspirational album of classical music, hymns, and the haunting "Lord's Prayer" in Aramaic. This heart-touching, spiritual CD will leave you feeling uplifted and inspired. This velvety French song will melt your heart. Performed by Cheri Jamison, Merrill Collins and world-renowned cellist Michael Fitzpatrick. 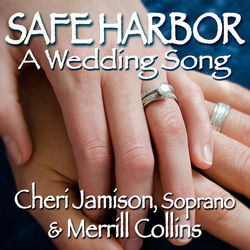 Cheri wrote the lyrics for this beautiful song, inspired by her own marriage vows. Music by Merrill Collins.